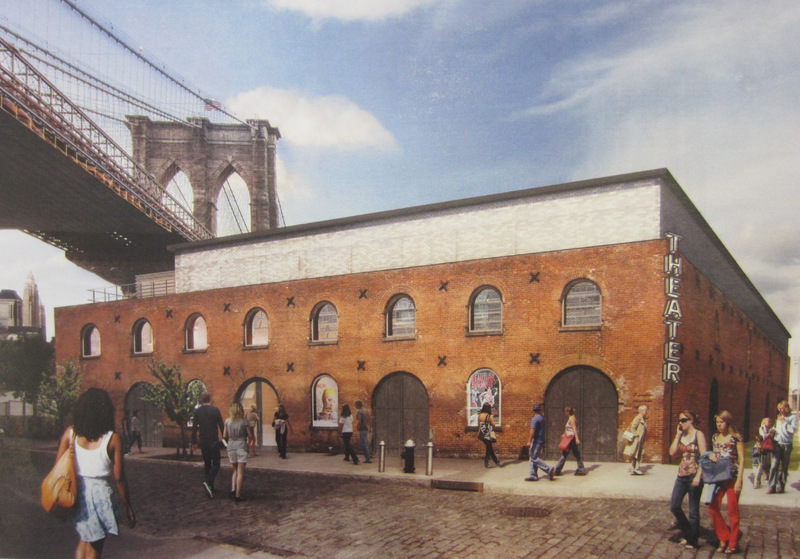 Rendering of proposed St. Ann’s Warehouse theater in Brooklyn’s Tobacco Warehouse. Image Credit: Rogers Marvel Architects. Commission heard testimony from those who opposed significant alterations to preserved ruin, and those who wished to see structure used as cultural space. On June 4, 2013, the Landmarks Preservation Commission voted to issue a favorable advisory report following a hearing on a proposal to convert the stabilized ruins of a tobacco warehouse into a theater and community facility space. The structure stands at 45 Water Street in the Empire Fulton Ferry Park within the Fulton Ferry Historic District, near the Brooklyn Bridge. The structure, listed on the National Register of Historic Places in 1974, was stabilized by the National Park Service, which removed the collapsing roof from the dilapidated building, and opened it to the public. In 2011, a coalition of civic groups and preservationists won a lawsuit after the National Park Service wrongly excluded the structure from the park’s boundaries on the request of the New York State Office of Parks, Recreation, and Historic Preservation in order to convey the land and warehouse to the Brooklyn Bridge Park Development Corporation. The District Court decision pointed out that the Parks Department must go through a formal conversion process, in which the excised land has to be replaced with suitable land of equal or greater value. The conversion process has not yet concluded. The government still intends to convey the property to the Brooklyn Bridge Park Development Corporation, which awarded a contract to the St. Ann’s Warehouse theater company to convert and occupy the space after issuing a request for proposals in 2010. At the hearing, Brooklyn Bridge Park Development Corporation President Regina Myer testified that the adaptive reuse of the tobacco warehouse had long been part of the park’s plans. Architect Jonathan Marvel, of Rogers Marvel Architects presented the plan, which would house a theater, community space, and an enclosed publicly-accessible planted triangle. Marvel said the design team was well aware that the warehouse was “beloved” in the neighborhood, and they approached the project “gingerly.” At the same time, Marvel said “we don’t want this building to be an eternal ruin.” He said the project would allow the building to become a place known to theatergoers throughout the world. A new one-story clerestory of glass brick, topped by an aluminum cornice, and set back from the existing brick would be constructed above the existing walls of the tobacco warehouse. A bulkhead set back from the facade would house office space and mechanical equipment. The theater would seat 200 to 700 people, depending upon the needs of the event. The building would also house a 100-seat community space. Marvel emphasized that neither the exterior or interior brick would be painted, and that they sought to retain the “rawness” of the existing warehouse. Marvel said the materials presented were inspired by the transparency of the ruin and the industrial architecture of the area. A corridor through the building would remain open when the theater is not in use, to maintain the “porosity” of the ruin. Windows and entrances would be installed in existing openings. A small portion of the roof would be visible from the Brooklyn Bridge. 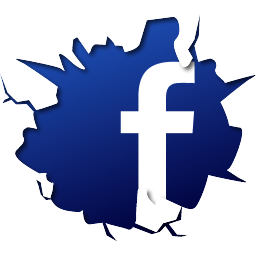 An open-lettered “St. Ann’s Warehouse” sign designed by Tom Fruin would be installed on the roof facing the public triangle. A vertical “theater” sign would be installed at the building’s corner on Water Street. Removable panels inside the structure would allow for the darkening of the interior at all times and the glass brick would be illuminated by LED lights behind the glass at night. Andrea Goldwyn, of the New York Landmarks Conservancy, argued that it was premature for Landmarks to consider the application before the conversion process was complete, and asked the commission to refrain from voting on the application. Goldwyn also stated that any new construction at the site should be reversible. The Society for the Architecture of the City’s Christabel Gough criticized the proposed design, and said it “avails itself of every square foot of usable space, without differentiating the ruin from the theater, or the new use from the old.” Gough urged a “more respectful, less utilitarian” proposal. Doreen Gallo, of the DUMBO Neighborhood Alliance, also spoke in opposition. She noted that Brooklyn’s industrial waterfront had been listed as an endangered site by the National Trust for Historic Preservation, and that the community desired the tobacco warehouse’s preservation as “an urban ruin.” Representatives of the Historic Districts Council, the Brooklyn Heights Association, and the Fulton Ferry Landing Association also testified in opposition to the proposal. A representative of the DUMBO Improvement District spoke in favor of the application and said the theater would be a “stunning reuse of the space.” A resident said that garbage tended to pile up in the existing open structure, frequently making it “look like a dump,” and if the theater were built then the space would be occupied by “something useful.” Laura Roumanos, of public art non-profit United Photo Industries, testified that the addition of space for community groups in the park would be a welcome addition to the area. Landmarks Chair Robert B. Tierney read a statement from local Council Member Stephen Levin, who was “thrilled” by the design, which he found to pay homage to the area’s industrial past and respectful of the original building. Levin wrote that the proposal would “allow the building’s potential to be maximized.” Tierney also said that Brooklyn Community Board 2 recommended approval of the plan. The Commission voted unanimously to issue a positive advisory report and will recommend that the proposal’s blackout panels be reconsidered. LPC: 45 Water Street, Brooklyn (14-3856) (June 4, 2013) (Architect: Rogers Marvel Architects).